Have you ever wondered why sushi prepared by a skilled sushi chef just tastes so much better than anything you could create at home? Homemade sushi might be a fun project, but it doesn’t hold a candle to the real thing. Sushi chefs have to learn far more than what a crash course on Pinterest can teach you. 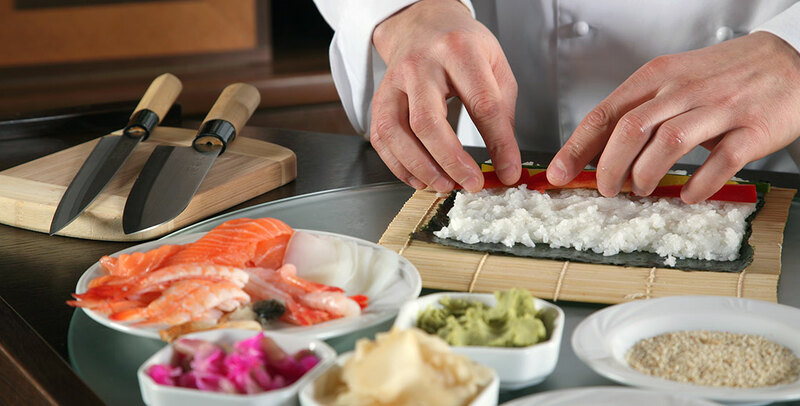 Here we’ll discuss the intricacies of sushi-making and what it takes to be a good sushi chef. When you think about sushi roll ingredients, there aren’t that many. Sushi, just like many other Japanese foods, are simple. But just because there are fewer ingredients doesn’t make sushi easy to master. There’s a lot that go into making good sushi rice. Even at all-you-can-eat sushi restaurants you might notice that the rice is a perfectly chewy texture. From the quality of the rice to other additives to the perfect cooking time, it isn’t a simple task that you can just do at home. It’s also vital that the rice is washed a few times before cooking it. This washes away the starches, allowing the rice to clump together once it’s finished. The rice vinegar solution must be poured on top of the rice when it’s finished. It often takes sushi chefs years to master rice making, using specific rice cookers or steamers that aren’t available to the average consumer. It seems like such a tedious thing to spend time on, but it’s important to the craft, making it important to a good sushi chef. Depending on the fish and the style in which you want to eat it, you might have to do some extra prep work that you didn’t anticipate. This could include marinating the fish or seasoning it with certain spices and solutions. A sushi master knows each type of fish inside and out. Eventually, preparing each specific piece of sushi becomes instinctual to them. Since it’s their craft, they have the time to study how to best prepare the fish–giving them a leg up compared to your at-home sushi. You could go to your local supermarket and buy a hunk of sushi-grade tuna, but it’s like you won’t find the highest quality. For example, you won’t find ho-toro or extra fatty tuna. This part of the fish is highly regarded in Japanese culture as one of the best quality pieces of sushi money can buy. Only an experienced chef will know precisely how to handle this rare cut of fish and they are the only ones that have the resources for obtaining it. Unless you buy wasabi root to make your own paste, the pre-made wasabi paste you buy is usually flavored and colored horseradish. Real wasabi has less spice and more flavor, which makes it an important part of the expertly-developed sushi experience. Again, this is an ingredient that someone who makes sushi for a living has better access to. The reasons behind why restaurant sushi is better are endless. From the fish itself all the way down to rice preparation the skills and resources of a sushi chef are simply unmatched. If you’re in the California area and looking for must-try sushi rolls, San Diego is a top choice. RB Sushi offers a great sushi experience at a bargain! Acquaint yourself with their skilled chefs and see for yourself.